This tool lets you make your own custom eye chart, just like the ones the eye doctors use. Fill in the details below and press the "Make the chart!" button. Your custom eye chart will be shown (containing the text that you entered) in the space above. This eye chart is modeled after the Snellen Eye Chart, used by professionals to determine how well their patients can see. The Snellen chart was invented in 1862 by a man named Herman Snellen. This chart doesn't use the same font as in the official charts, but it's close. What should you put in your custom eye chart? You can put in any message that you like. The eye chart generator will take your message and create a chart for you. 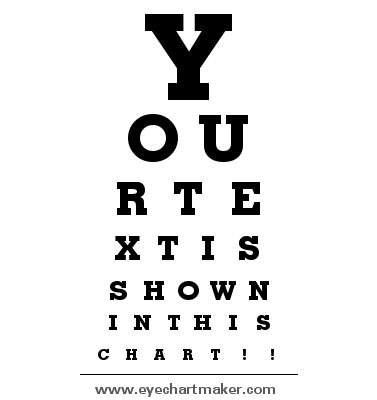 As for what to do with your custom eye chart, it's up to you! The only limit is your imagination. Put one on your website. Email it to a friend. If you liked the custom eye chart generator, try making a custom road sign! Put your message on a cake - Say it in icing!